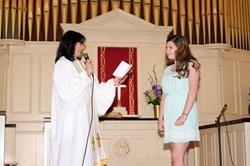 At Pilgrim Church, confirmation is the act of the youth affirming his/her baptism and formally stating that s/he wishes to be affiliated with this faith tradition. During the Confirmation Service, each young person is given the option to join the church, thus becoming a full member of the congregation. There are regular meetings with the pastor. Confirmands may range in age from 13-18 and may take up to three years to complete the program at the discretion of the Pastor and Director of Children's Ministries. Pilgrim Church requires that the youth to be confirmed has a broad understanding of the Bible, the sacraments, the United Church of Christ, and Pilgrim Church and to that end, it is expected that the youth will regularly attend worship and Sunday School. Confirmands will understand theory and practical application of covenant, tradition and congregation. They will participate in the real life practices of the Christian church through worship, community, devotional life, and service. Each youth will complete ten hours of service (through at least two different projects) over the course of each year. Bible: Each participant will gain an understanding of Biblical basics (including Old and New Testament stories). Church: Each participant will gain an understanding of the history and governance of Pilgrim Church. Sacraments: Each participant will gain an understanding of the sacraments of Baptism and the Lord’s Supper. Theology: Each participant will gain an understanding of God, Jesus, and the Holy Spirit. UCC History: Each participant will gain an understanding of the history of the United Church of Christ. UCC Polity: Each participant will gain an understanding of the governance of the United Church of Christ.